Avantalk BTCK-10 is a Bluetooth MULTI-POINT clip-on visor car kit, Unique stylish design, can support two phones at same time, advanced Built-in Microphone and Speaker, with echo cancellation and noise suppression make the car kit with superb sound quality. 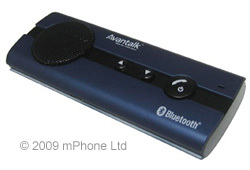 With Avantalk BTCK-10B, you can talk free and legally in your car! Full 1 Year Warranty. Click on the buy now button below and place your order to receive this device within 2-3 working days.